Envelope, A1 Cream 3 5/8" x 5 1/8"
Home > Envelopes > A1 Envelopes - 3 5/8" X 5 1/8"
Measurements - 3 5/8" x 5 1/8"
Our Cream A1 Envelopes fit our small notecards and everything 3 1/2" x 5" or lower! These Cream A1 Envelopes are made from a 24lb bond / 60lb text (90 gsm) cream paper stock and are inkjet and laser printer compatible. 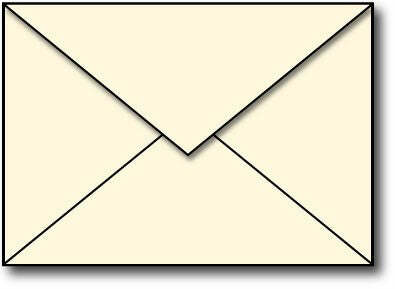 These cream A1 envelopes measure 3 5/8" x 5 1/8" each and feature a pointed flap. Standard moisture activated gummed flap.